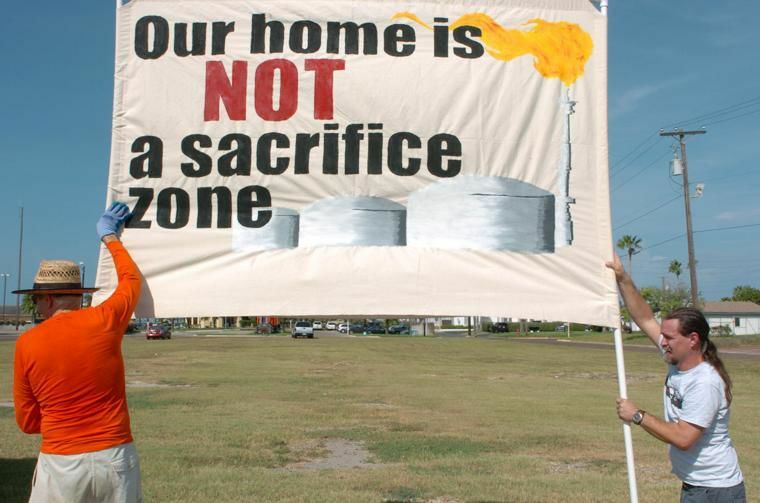 Residents opposed to three proposed liquefied natural gas (LNG) export terminals carry a banner as protesters against the plant set up Tuesday afternoon in Port Isabel across from the Port Isabel Event and Cultural Center. The Save RGV from LNG and the Lower Rio Grande Valley Sierra Club will hold a benefit concert Friday in Port Isabel. The event will feature a performance by Weslaco-based band Texas Sweethearts and aims to raise funds for their efforts to oppose liquefied natural gas terminals at the Port of Brownsville. “LNG is not a done deal in the Valley,” she said. The organizations’ supporters have submitted hundreds of comments to the Federal Energy Regulatory Commission against the LNG terminals, Hinojosa said, adding that South Padre Island, Port Isabel, Laguna Vista and Long Island Village have passed resolutions opposing LNG facilities. The U.S. Army Corps of Engineers has informed two LNG companies proposing plants at the Port of Brownsville that their applications are no longer being reviewed due to missed deadlines for requested information. CEOs for Annova LNG and Texas LNG said this week they are continuing to pursue the establishment of terminals at the port. during the Protect Our Laguna Madre Benefit Concert at Causeway Cafe. The organizations are seeking to raise $10,000 to hire an environmental attorney to assist them in submitting comments after the proposed LNG plant environmental study and permits are released, he said. “Because that’s a big, big detailed document, we want to have attorneys assist us to make sure we’re responding with as much detail as possible,” Chapman said. An attorney with the Houston firm Irvine & Conner will speak Friday, he added. The benefit concert will run from 6:30-9 p.m. at 418 Queen Isabella Blvd. Tickets are $10. Find event information on Facebook at facebook.com/saveRGVfromLNG.